Sam is a witch - well, half witch on her mother’s side - who owns a shop on Bourbon Street in New Orleans named Bell, Book, and Candle. But when children start killing people, things could get personal as danger creeps closer and closer to home.. 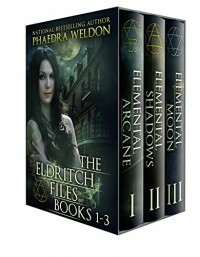 These attacks are only the beginning of the cases she will solve in this boxed set, and they could potentially start a chain of events that ends with someone she loves dearly being taken from her. Add a possessed doll head, a wolf familiar, and cyber magic, and this makes for quite an interesting read. I must admit to a love/hate relationship with this particular set of books. Part of me would love to keep them, while the other part - the editing/proofreading part of me - wants to chuck it in the bin for its too simplistic writing and the fact that as a reader I feel like some of the antics of this main character have been lost in the ether. These supposed first three books should definitely not be the first three. There should have been at least one before these three according to situations described in the not aptly named first book of this series. However, in this case, the part of me that wants to keep them has won out, and that is due to the likability factor of the characters involved. Even the villains of these stories are likable, in a “hope they get caught and put away for life and afterlife” kind of way. 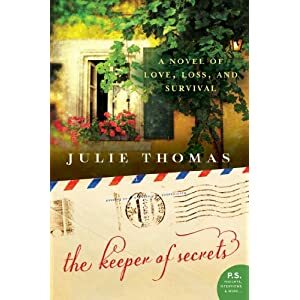 Beautiful and mysterious, The Keeper of Secrets by Julie Thomas follows a priceless violin across generations—from WWII to Stalinist Russia to the gilded international concert halls of today—and reveals the loss, love, and secrets of the families who owned it. In 1939 Berlin, 14-year-old Simon Horowitz’s world is stirred by his father's 1742 Guarneri del Gesu violin. When Nazis march across Europe and Simon is sent to Dachau, he finds unexpected kindness, and a chance to live. In the present day, orchestra conductor Rafael Gomez finds himself inspired by Daniel Horowitz, a 14-year-old violin virtuoso who refuses to play. When Rafael learns that the boy's family once owned a precious violin believed to have been lost forever, Rafael seizes the power of history and discovers a family story like no other. This book is a story about passion, music, loss, survival. It is about three different generations and the violin that connects them. It is about never giving up, and having something to live for. Having something to fight for. It is simply a phenomenal read, and will leave you speechless to its end. When she was a child, the author of When Women Were Warriors happily identified with all the male heroes she read about in stories that began, "Once upon a time, a young man went out to seek his fortune." But she would have been delighted to discover even one story like that with a female protagonist. Since she never did find the story she was looking for all those years ago, she decided to write it. When Women Were Warriors is the perfect representation of that time between childhood and adulthood when one feels as if their dreams are way too big to achieve or they are way too inferior to achieve them. The main character of this story, Tamras, has heard stories of these women warriors her whole life, her mother having been one of them in another place and another time, and thinks she knows just what will be asked of her when travels to become one herself. But nothing could have truly prepared her for what she is bound to experience. Her new life will be filled with potential heartache, loneliness, and even great wisdom, both from those above her in status and those equal in her measure. She will touch lives, touch hearts, touch minds... She will discover things about herself she never would have discovered otherwise... In a nutshell, this book is breathtaking. 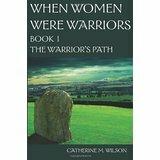 It will leave you wanting to know more about the world surrounding Tamras and her fellow women warriors. It will leave you satisfied, yet wanting more. And finally, it will leave you yearning for times long past when strength was not just physical, but mental, spiritual, and emotional. Reblogged from Reading is my ESCAPE from Reality! I was actually warned about reading this book. There were so many people who said I wouldn't like how it turned out. But, being the rebellious person I am, I decided to figure for myself whether or not I would like it...and guess what? It actually turned out to be my favorite in the entire series. After my bad reaction toward Tris's actions in the second book, I was kind of hoping that she would redeem herself in my eyes with this one. And she did, but I found myself feeling badly toward Tobias this time around. He just annoyed me a little bit. It just seemed as if his insecurities began to get the best of him. I mean, he was always a bit insecure, but in this book it was magnified tenfold. Obviously I still really like him as a character, but it just rubbed me the wrong way how he just abandoned everything he was at the drop of a hat just because someone told him he wasn't "perfect". All in all, I found this to be a bittersweet, yet perfect end to a series I must admit I almost didn't read almost two years ago. Many thanks to my Kindle for recommending it. And a HUGE round of applause to the author and her team for a wonderful job. Up until she meets Natalie, Grayson and Alex, Molly has no friends to speak of. She is a brainy, socially awkward 7th grader attending the Metropolitan Institute of Science & Technology (MIST). Molly helps out in the morgue where her mother worked before she died. Little does Molly know how much her world is about to change. Natalie and the others are Omegas, basically zombie police. Molly finds out the world is more complicated than she thought. New York City is full of zombies. But these aren't your typical zombie. There are three levels: Level 1's look and act just like us and they want to basically live normal lives; Level 2's look and act like us too but they have no soul and therefore no sense of right and wrong; Level 3's are more like the zombies you see in movies, they stay underground most of the time and can't really pass for human. After discovering all of this, Molly finds out that her mother was an Omega too and she prepared her for this work all her life. Molly doesn't always make the right choices, but she does try to do the right thing and the rest of the team stands behind her. 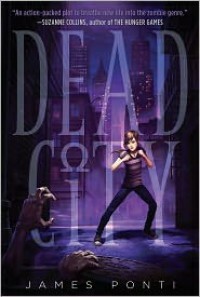 The danger of Dead City (underground where the zombies live) is exciting and scary.The surprising twist ending has me dying to read the sequel. I really enjoyed this book. It manages to look at zombies in a new light. There are a lot of zombie books out there and I have read my fair share. And don't get me wrong, I am a huge fan of the Walking Dead. But James Ponti has written a book that brings the zombies into a new light and makes them safe entertainment for middle graders. This book is great for fans of middle grade books. Many of the 4th & 5th graders at my school seem to really enjoy it. 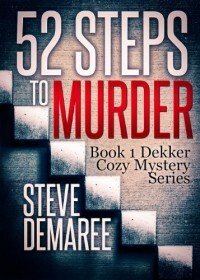 It's a great book with lots of action and suspense. It manages to be scary without being too blood and guts graphic (good for middle graders). I flew through this book in a few days and can't wait to read the next one. 4th - 8th graders who are looking for a twist on the zombie genre. Unfortunately, while I like murder mysteries and police procedurals, this just didn't float my boat. The chapters were monotonous and I felt like every little thing was described, from the daily routines of the two main characters to their very thoughts. It was ultimately not a book I could finish, and I just wish it had been executed better. On a positive note, I do like the cover. So to me, an assassin, or my vision of an assassin character, is kind of quiet, calculating, doesn't trust anyone, and most likely has a past they would rather forget. Now Celaena does fit some of these characteristics. Her family was murdered, she's spent most of her life killing, and due to events that I'm still not quite sure of, she has spent the last year in the Salt Mines of Endovier, a place most people never leave alive. She is strong, a fighter, and you would think those characteristics would stay steady throughout the novel. And yes, we do see these characteristics again, but sadly only in fleeting moments. The rest of the time, from the moment she accepts Prince Dorian's offer to fight to become the Kong's Champion, she acts a spoiled brat. She is vain, almost sickeningly so, and acts almost as if she has a heart of gold. And the way she plays the two male characters is almost laughable. It is almost as if the author could have done away with the King's Champion nonsense. It just didn't seem to fit. That said, I didn't mind that there was some romance. I just wish it had been handled differently. Celaena is still grieving over the last man she loved. Whether it be due to his betrayal (still not sure about that) before his death or whatever made her lose him, her heart should be more guarded. She should have resisted for as long as it took until she could no longer deny her feelings. I just think that whole aspect could have been planned and written better. Also, her feelings toward the king were too calm. He is the one who basically killed her parents, whether directly or indirectly, it doesn't matter. It should have haunted her dreams and made her question if leaving Endovier was worth it. It should have made her think about killing him and running. Obviously something would stop her from doing it, but I wanted that tension. Now, I am not saying that everyone will hate this book, some of you might like it, but for me, after all my expectations, it was a disappointment. One last thing. 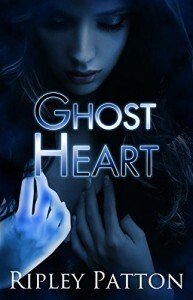 The cover does not really match the main character's description. She has blonde hair, not white. She doesn't constantly carry around weapons, unless they are makeshift, although the weapons on the cover are cool and I kind of want them now, and she actually complained at one point that the clothes she was given were ugly and embarrassing (aka tunic and pants). Practical clothes for the task at hand. Huh?! How does that make sense. Anyway, I probably won't read the second one, unless I check it out from an online library or get it free, but even then, my thoughts on it are kind of iffy. There comes a time when I need to step back from the book or books that I am currently reading and begin another story entirely. I have learned that by doing this I do not get burned out as fast reading wise. This particular book was a perfect buffer for my current selection. 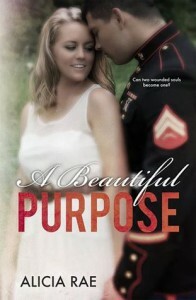 This story is beautiful and well-written and had some wonderful characters in it. It also had an underlying sense of foreboding behind it that just made me love it even more. I adore the feeling of mistrust when reading, because it tells me something is definitely going to happen, something most likely involving treachery. One thing I wasn't a fan of, however, was the main character's cowardice. It just kind of bugged me that she was so willing to give information to the bad guys. I mean, I definitely understand why she did, being tortured and all, but it just irked me. It did help that she acknowledged she was this way, and was sorry for it, but not by much. Other than that, though, and the sudden abruptness of the ending, there was really nothing wrong with this book. The plot was strong and had great direction and everything fit together well. This is the start of a series that I know I am going to love reading, and possibly the start of me reading every other book in this author's repertoire. I take anthologies very seriously, so when given the choice to read one selection from the Shades of Chaos anthology, I went through each book and read a passage or two. 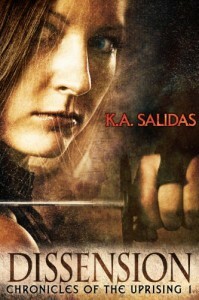 Then with actually not much deliberation at all, I chose to read and review Initiation and Dissension by Katie Salidas. 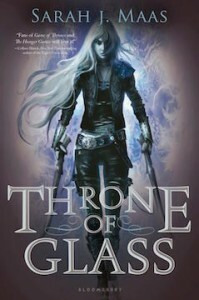 Now since Dissension is quite a bit longer than Initiation, which is a handful of pages and merely describes Mira's first battle in the arena as a gladiator and her thoughts on her last day of freedom and the terrible agony her capture caused her, I will be focusing mainly on that piece in this review. First of all, let me just state that I love the series prologue. The basic history of what happened to lead us to this moment in the story where Dissension starts. It describes two species, shaken up by terrifying events that led them to restart their entire society. Vampires and humans had to work together in the beginning, but things take a turn when the humans find a way to come out on top. And come out on top they shall...which is how the games themselves started. Vampires, which have been considered the epitome of evil for centuries, are now the victims. Having to shed blood for the humans' amusement just to be able to feed on a regular basis. You win, more rations. You lost, you either die quickly, if you are lucky, or are tortured by light. Not enough to kill, but enough so you feel every ray. It's enough to make this human want to go inside this book and be one of the opposers of this atrocity. I want to be one of the rebels who helps Mira out in her and the Regent's mission to stop this. Dissension takes place thirty years after Mira was placed in her first battle in the arena. Thirty years after she learned she needed to do whatever it took to survive. She has become the best fighter of her region, but she has yet to succumb to her enslavers. Which I absolutely love. Her attitude may get her in trouble, but it is that very attitude that had me rooting for her from the very beginning. Some characters are quiet until a chance at retribution reveals itself and they take it, fighting against the forces working against them, and that works for them. But Mira never failed to find a reason to fight back, even if it was just with a few choice words, or, in her case, A LOT of them. There was a couple of cases where I thought the snark was unnecessary and where it would have benefited her and possibly the story itself if she was quiet and simply assessed her surroundings, but other than that, I absolutely thought she was a great character and one to definitely watch. Now I actually would have liked more of the Regent's own point of view throughout the story. He is the one who becomes Mira's Patron after meeting her in a way that could have basically signed Mira's own death warrant. But after meeting with him a few times and talking, which is not usually what a Patron would do with their hosted fighter, she realizes that he is not like all the other humans. Well, she actually goes back and forth between thinking this and thinking that he is just like all the others, because honestly, the humans have given her no reason to trust any of their kind. But it is after a particularly heavy fight, one that nearly kills Mira, that things take a turn toward her possibly being able to trust him with the information she knows and which he asks of her. This story is definitely full of action, a bit of humor, and is absolutely a wonderful start to the entire Chronicles of the Uprising series. It needs a few tweaks here and there and could do with a bit more meat to the story, mainly another point of view, as stated earlier, sprinkled throughout, to make it seem a bit more whole, but other than that it is one worth reading. 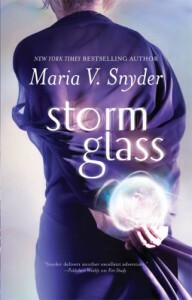 I am putting the series on my TBR list because I have to know if Mira gains the freedom she so craves. This story made me feel for the vampire race. It made me long for humans to understand that in this case, they have become the monsters. I have to be perfectly honest. 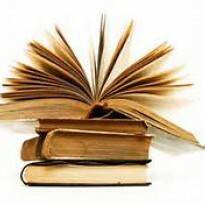 Unless I have read the previous books in a series or can make time to read them, I never decide to read a sequel. It's just not in my nature. I have to know what happens beforehand in order to gain a sense of the novel I am set to review. But this one caught my eye with one name. Kayla. A princess of Gaynor and wild magic witch who has almost tamed the banished magic that resides in the great forest. I say almost because no matter what, the wild magic she can command still has a mind of its own as we find out near the very end of this particular installment in this series. But this name, a mirror of my own, and this character spoke to me. I just had to know this story. I had to read the second book first in this case. 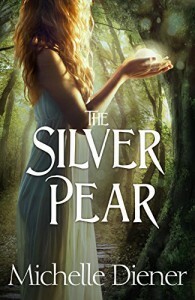 Because I was not able to read the first book in the series, I was actually quite ecstatic that the author gives a little sense of what happened in The Golden Apple at the beginning of this book. It doesn't reveal everything that might have happened, but at least the gist is pretty well touched upon. It segues great into this book, telling the reader all the information, or at least most of the information, needed to be able to know what is going on in the story or what has gone on in the story so far. Our characters are pretty well separated into pairs in this book, each pair having their own chapters until finally near the end all four are reunited again. We have Rane and Kayla, and Soren and a new character Miri. Now Miri, as stated in the book's blurb, was bespelled by her father in the womb to be the greatest sorcerer who ever lived. And she definitely is a great sorcerer. But unlike other sorcerers, she uses her magic to help instead of hurt. So it is no surprise that she saves Soren when given the chance to either do that or run. Even when it means her own capture and the loss of her most prized possession. He returns the favor, even with the knowledge of what she is and his animosity and vow to kill all sorcerers, and they escape, not knowing that it will be matters of the heart helping to keep them together soon enough. Rane and Kayla are on the search to find both Soren and get back the golden apple in Nuen's possession, making a stop back at the Great Forest to free the earth witch Ylana from the spell that currently binds her. Kayla will plead her case to learn how to control her magic and the providers of that magic, but it will be up to Ylana herself whether or not her animosity will allow her to teach the girl. And without her help, the war of the sorcerers that has been looming might just arrive. 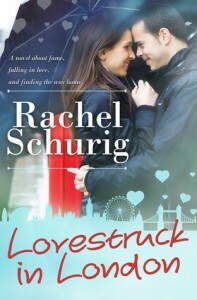 I really did love this book. I mean, I really didn't feel lost due to the explanation of what happened in the previous book. However, there were a few times where the story didn't feel as full as it could have. The story itself was complete, but I didn't feel as fulfilled, like something was missing. Other than that, there were a lot of wonderfully written scenes, and the world itself, especially the Great Forest, was quite beautiful in its descriptions. I especially like the imp in the dress. (You'll definitely have to read the book to understand.) I currently have the first book and will definitely be putting it on my TBR list just so I can gain more of a sense of the characters from the very beginning. And I will definitely be reading more of this author's work in future. On that note, I have decided that I am going to start a support group for readers who have a tendency to read ahead, aka skimming pages or turning to the back of the book just to make sure a character doesn't die or something (that is how I ruined the seventh Harry Potter book for myself). It is a very terrible disease and can make your life a living nightmare! 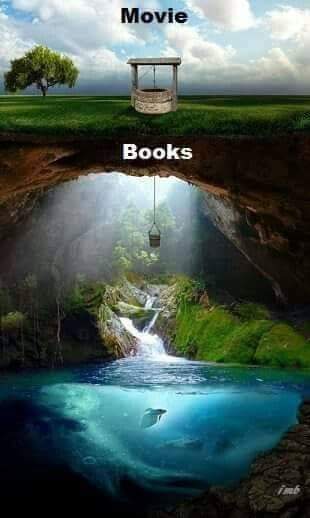 Or at least take all the fun out of reading. I shall call it PA. Peekers Anonymous. Comment if you have a better name. You can tell I have actually thought about this long and hard. So anyway, the whole point of saying this was because that is exactly what I wanted to do throughout this entire book. I had to know what was going to happen. I had to know if I could trust people or if my gut was right about there being a rat in our midst. I have to admit that I did turn to the last few pages while I was still in the beginning of the book, but thankfully I had my eyes squinted enough that I saw nothing. And I am glad I did, because like I said, it would have made the journey to the ending less stressful and I hate when I can't stress over a book. It makes me feel so alive and the story so much more readable. This particular book in the series has a different format to it than the past two. Instead of having only Olivia's point of view, due to the characters being separated we are allowed both Marcus's and Passion's points of view as well. These three different characters allow us to gain a well rounded view of the story just as we get in the other two, but it also allows us to see characters we have gotten to know in a whole new light. We get to experience their feelings, thoughts, and in Marcus's case, what with his most recent dying experience and the repercussions of that, old wounds being reopened as if they were never closed in the first place. I literally want to bang my forehead against a wall or something like it due to the fact that the fourth book won't come out until next year. I am in love with this series, these characters, and the whole PSS idea. This is definitely a remarkable series that will have a special place in my heart, and most especially this particular installment. 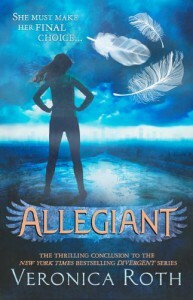 I have to admit that I was a bit torn throughout the beginning of this book. You see, sometimes when I read a story I envision the characters' personalities differently than the author has written them. Sometimes I feel that in order for the story to flow a little bit better a character needs more of a certain quality or characteristic. And that is exactly how I feel with this, or at least that is how I felt before finishing this book. While both main characters are so perfect for one another, and some of their scenes were so heartfelt and funny and just made me grin to no end, I felt that their relationship could have been delayed a bit more. And by that I mean that I kind of wish the hesitancy on both ends would have lasted a bit longer. I wish that on both ends they would have resisted a bit more due to their own personal demons. It would have made their budding love so much sweeter, Audrey's rejection so much more heart-wrenching, and their ultimate realization that neither would be anything without the other all the more wondrous and joyful. That said, while I do believe it could use a bit more finesse, the storyline itself is beautiful. Two souls tortured by different events coming together as one. Finding love when love does not seem a possibility. And while I do say that I had a bit of a conundrum regarding the beginning of this book, from the moment the paintball event occurred, I was immediately hooked from the first giggle that left my lips. While Blake and Audrey are the main focus of this book, I love how each character brings their own quirky lives to the table. Well, that is in the case of Blake's brothers, their women, and his cousin and her man. I love stories where all the characters are interconnected and know each other in some way, especially when the book is a part of the series where each character is allowed their own life to be delved into. This book is not perfect by any means, but its story is. I definitely will read the other books in this series, and will probably remember Blake and Audrey's particular story for months to come. It is completely worth buying this book just for the happy ending, and I recommend it to any and all fans of this genre. Now this more like it. After the experience I had with the book before this one, I was a bit relieved to see this book focus more on the actual search for treasure than on the general fight against the antagonist. 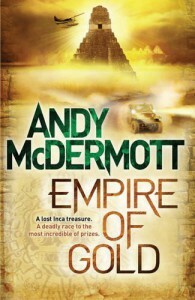 Don't get me wrong, though, there is plenty of fighting and shooting and all-around survival tactics, including at least one thing blowing up, but this storyline was more about the initial find, because everything pretty much revolves around the location of the empire of gold. Else Dorado. And I mean everything. Because the finding of this miraculous place will begin a series of events that ultimately could change our characters forever. And not in a good way. I think what I like most about this book in the series was how it reminded me so much of when I read The Cult of Osiris. It was my first experience with this author and probably one of the most magical I've had in a while. There was just something about the characters and the search that amazed me and fed the archaeologist/egyptologist inside my mind. It was so great to go back to that memory. And hopefully this continues on for me throughout the rest of the series. But if not, I will still read the other books with relish, because there is just something about them that absolutely floors me every time. So, I honestly couldn't decide whether or not to give this book a five, but after reading the ending, I thought I might as well. This book, despite a couple parts, small ones, which seemed to drag on slightly, was phenomenal. I mean, it had everything I absolutely love in a romance and then some. The main character, Lizzie, was so relatable to me, and I just rooted for her the entire time. And Thomas, well, he brought a huge smile to my face quite a few times. Both of them just felt so right together, and for me that is a big deal, because I have read plenty of books where the characters just don't seem to have a spark but still end up as a couple. It's just not right. But these two definitely did not have that problem. I think what I love most about this story is that Lizzie love for London is so similar to my own love for Ireland. I've never been there, but I feel a connection to it, like I've either been there in a past life or am going there in the future. I feel like it is my one true home, like it is a part of me, part of my soul. It is an indescribable feeling, and one that I hope pans out to me living there someday. As for the rest of this series, I am absolutely going to read the other books. I have to know that Thomas and Lizzie are going to be okay. That all their dreams will become realities, and that their love will continue to flourish.